Happy Campers and Healthy Boater products are designed to totally eliminate odor in RV’s and Marine holding tanks, by using a 100% organic, environmentally friendly product that is guaranteed to ensure comfort, ease, and confidence to your next camping or boating experience. Happy Campers and Healthy Boater products are environmentally friendly made up of a completely safe blend of concentrated minerals and micro nutrients that are good for septic tanks. This unique blend is biodegradable, use absolutely no formaldehyde and digests waste as well as most household tissue. Our product is designed to work in extreme climates and last longer than any competitive product on the market. Compare Happy Campers and Healthy Boaters effectiveness yourself to see the product’s effectiveness and tremendous savings at cost per treatment. In 2002, RV Concepts, a small company located in Medford, Oregon, formulated a new and better product for the RV market. The company owner, Monty Wray, realized he had a product that would revolutionize the camping industry and the comfort of campers. 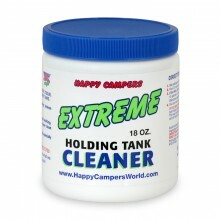 He named his product Happy Campers Odorless Holding Tank Treatment.